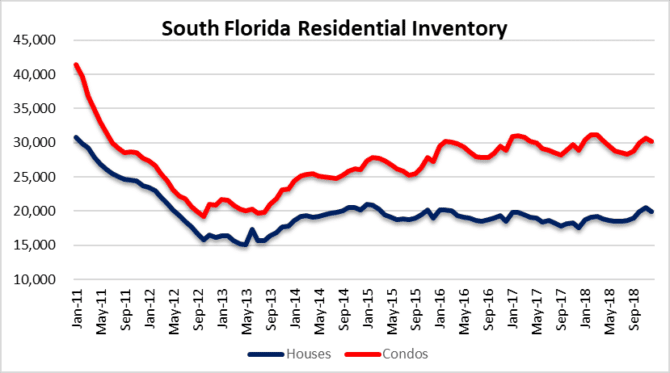 Has the condo correction already started in South Florida? By looking at the latest numbers, it appears so. Today we will focus on Broward County, which includes the cities of: Fort Lauderdale, Pompano Beach, Deerfield beach, Hollywood and Hallandale Beach just to name a few. 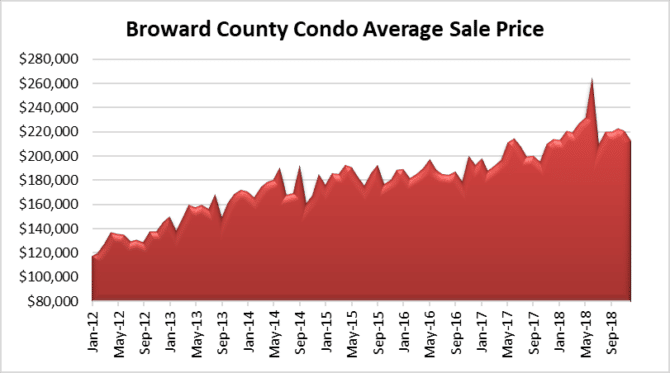 Our first chart today shows the average selling price of condo properties in Broward County. Since the June 2018 peak in prices, the average sale price has declined 20% through December. I think that would be considered a “correction” if you ask me and it looks like it is just getting started. 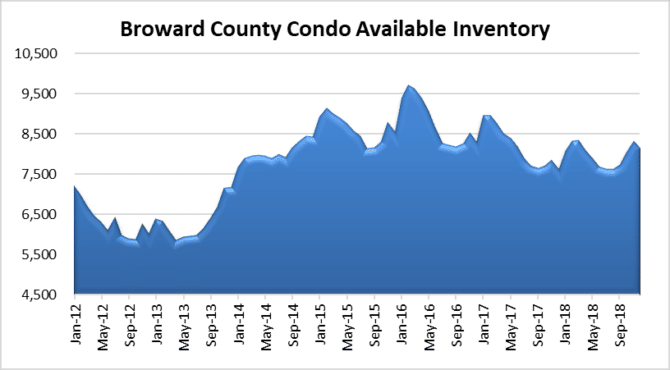 The available condo inventory listed for sale in Broward was 8,128 during the month of December. Our guess is that it will climb as we begin 2019. Sellers have a tendencies to remove their properties from the market during the holidays and relist them in January. We shall see. This chart does not include all of the new construction product entering the market either. Developers only tend to list a small fraction of the project in the MLS and they wouldn’t have to keep sweetening incentives if they didn’t see demand for their product eroding. 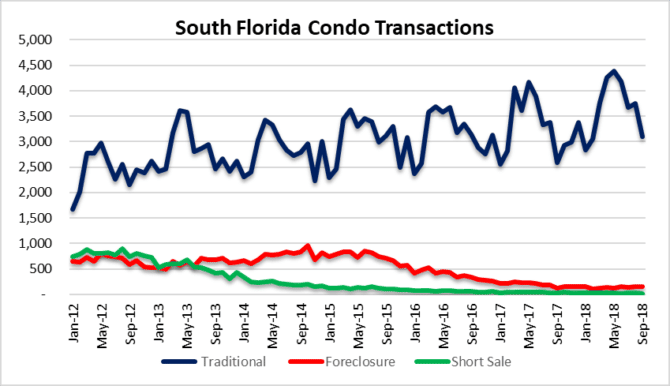 This next chart shows the median sale price of condo properties by the type of transaction. Sometimes the average sale price metric is more volatile, but you will notice from this chart that the median sale price of traditional sales has declined 13% since June. The median foreclosure sale prices have dropped 10% and short sale median prices were down 41%. The distressed sale prices have been more volatile as the volume declines. The higher-priced units will drag the median prices up once they are sold, hence the periodic spikes in the chart. Of course the distressed property owners who have the resources to fight the foreclosures have dragged these cases out since the last crisis and those units are eventually hitting the market. 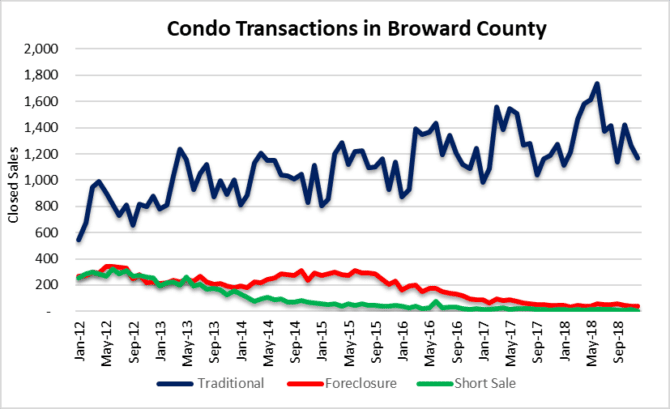 There were 1,210 condo property closings during the month of December, representing a 33% decline from the 1,806 closings in June 2018. Although some of this slowdown is seasonal, it looks like the overall trend is down. 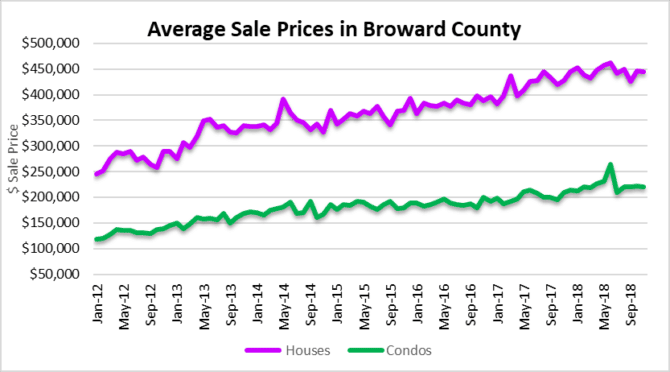 Our last chart today compares the average selling price of houses and condos in the Greater Fort Lauderdale (Broward County) market. The average sale price of a single-family home has only declined 5% since June, while condos have dropped 20% for the same period. 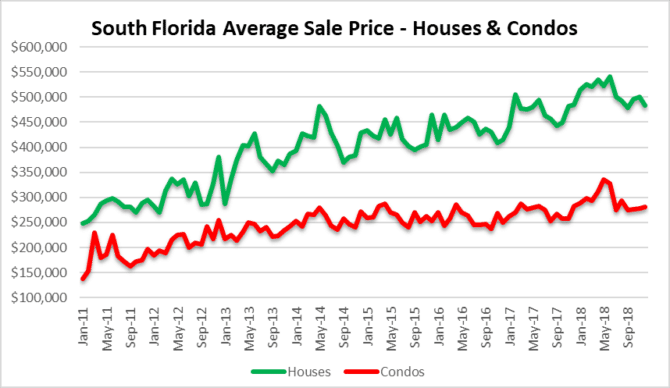 Both housing segments are facing headwinds, so it should be interesting to see how this chart develops as we progress through 2019. I saw a brief news segment on how all the rich people in New York are buying mansions in South Florida. Not according to the average sale prices. They have flat-lined and it looks like the next move is lower. In addition, a few large transactions tend to distort the data, so don’t believe everything you hear. 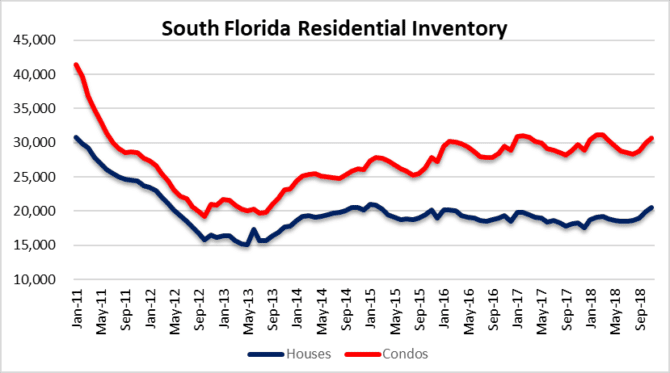 We still believe that the South Florida residential market peaked in June 2018. Since then, the average sale price of a house has declined 10% and condo prices have declined 14%. Is that booming or collapsing? 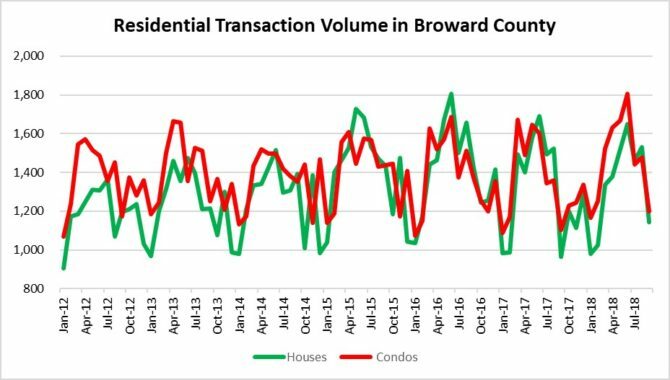 The number of houses and condos listed for sale dipped slightly in December, but that is typically seasonal as people take their properties off the market during the holidays. In December there were 50,167 properties on the market, down from 51,256 in November. The number of residential listings should snap back in January. There was a total of 6,647 residential sales closed in December. These numbers include houses and condos in Miami, Fort Lauderdale and Palm beach areas. That number is down slightly from 6,711 in November, but down a whopping 27% from the 9,141 closings back in June 2018 when the market peaked. As for the 2018 summary, the numbers fared pretty well compared to the last few years. 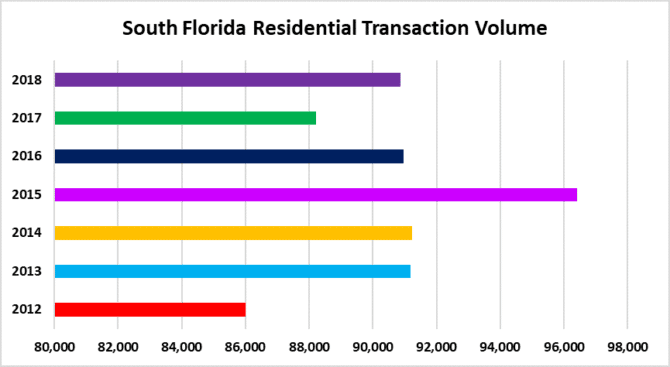 The 2018 monthly average of transactions in South Florida climbed 3% over 2017. You can see from the chart below that 2015 was the big winner. 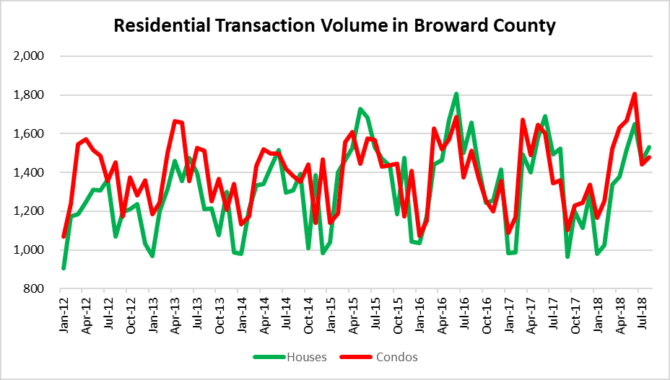 Although transaction volume ended the year o.k., we will continue to monitor the numbers as this latest housing bubble may be leaking air. After nearly a decade of record low interest rates, bailouts and foreclosure moratoriums, the real estate market will eventually have to pay the piper. 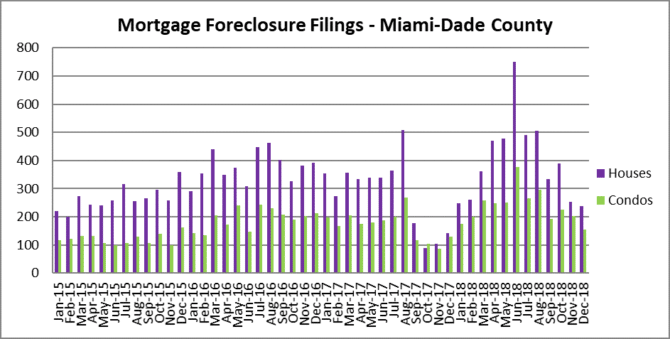 Today we will do a year in review with a look at foreclosure filing activity throughout South Florida. It’s crazy to think that ten years after the last housing bust, the delinquent mortgages still remain. 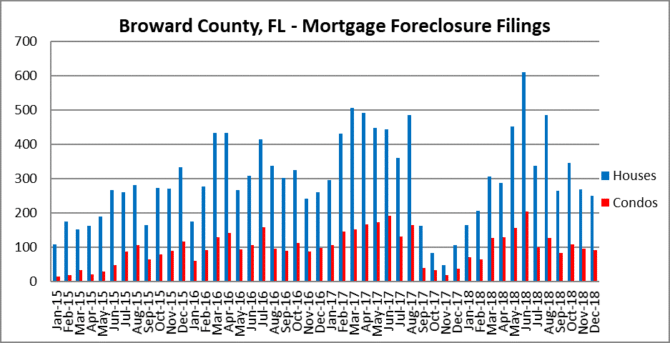 There have been a variety of foreclosure halts in South Florida over the last decade. As a result, we continue to wrestle with this problem. Also, the fact thatFlorida is one of the 22 judicial states in the U.S. that doesn’t help matters. delinquent borrowers and their attorneys have gained years of experience on gaming the system. 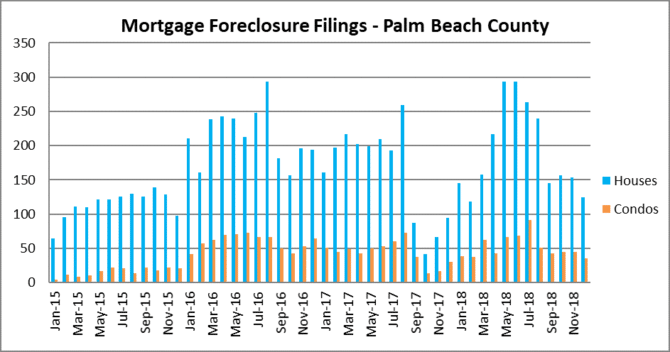 Our charts today illustrate the monthly foreclosure filings in Miami, Fort Lauderdale and Palm Beach houses and condo properties. 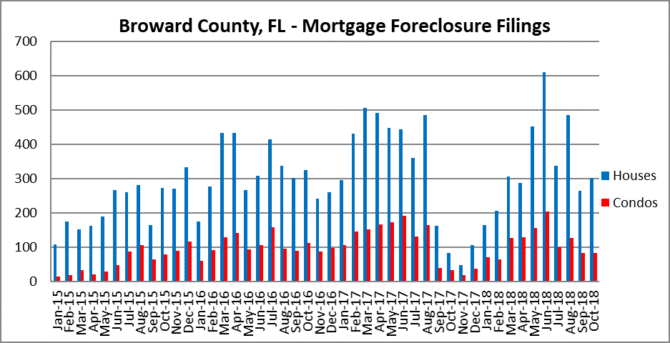 The months of may and June had a large number of new foreclosure filings in Broward County. 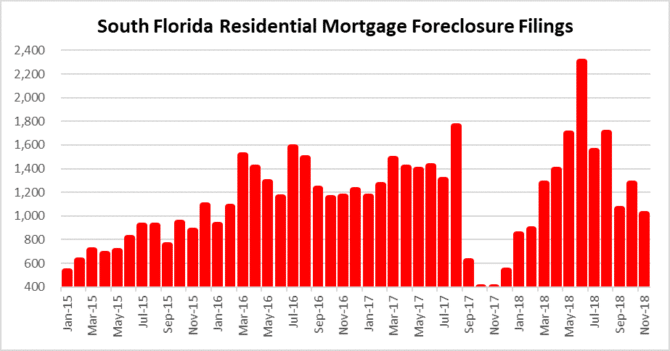 There was a foreclosure halt in the 4th quarter of 2107 due to Hurricane Irma. As a result, there was a sharp decline in 4th quarter filings. Maybe it took awhile to get some of those filings cued-up again. It’s anyone’s guess at this point! The new filings in Miami remained strong through the summer months: May, June, July and August all had above normal filing counts. After that, the filings tapered off, but the averages in 2018 increased over 2107. Look at the September-December 2017 portion of these charts to see the last halt due to Hurricane Irma. 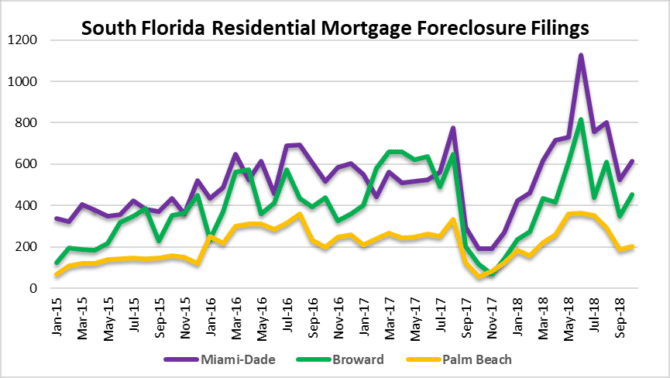 Palm beach seems to have fared better than Miami-Dade and Broward over the past few years, but still has it’s share of mortgage loan defaults. Will the real estate agents see it this time around? So many of them were blindsided by the last downturn. They were busy selling and collecting commissions on overpriced properties, ignoring all of the signs of a frothy market. My guess is they won’t see it, because they don’t want to. More importantly, real estate agents seem tone deaf to shifts in market sentiment. Are they letting their customers know that they might be “stuck” with this one for awhile? I doubt it. Accoding to them it is always a good time to buy a house. 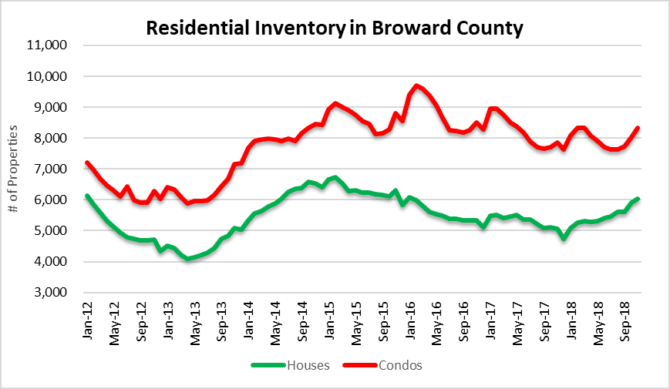 Today we will look at mortgage rates, transaction volume, inventory and prices in the Fort Lauderdale area and hopefully shed some light on the local market. The good news is rates are dropping again. The bad news is that there is trouble brewing in the economy for them to decline so far so fast. If the economic outlook was positive, this would not be happening. It may get some additional buyers of the fence, but for all the wrong reasons. Even with low rates, mortgage applications showed a sharp decline toward the end of 2018. 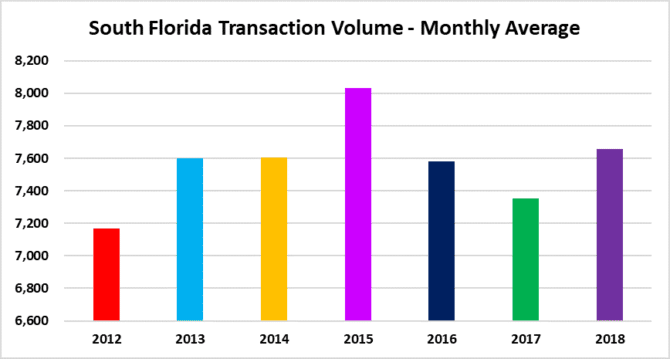 The number of transactions closing was healthy in 2018, compared to the last six years. 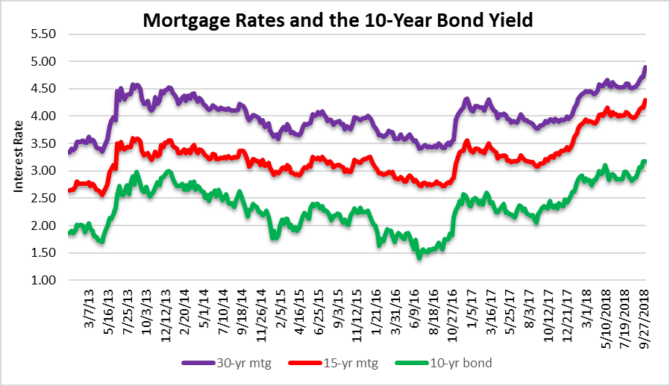 Rates remained in check for most of the year. This chart shows the average number of residential closings through November of 2018. You will notice that 2015 and 2016 were very strong and if you glance up at our rate chart you will see why. It sure looks like residential inventory is on the rise again. This is usually a good indicator that prices will start to decline. If you are out looking at properties throughout Fort Lauderdale, you will probably notice that plenty of signs have been in the yards for awhile. This is because property owners and their agents haven’t been able to come to grips with a changing market. 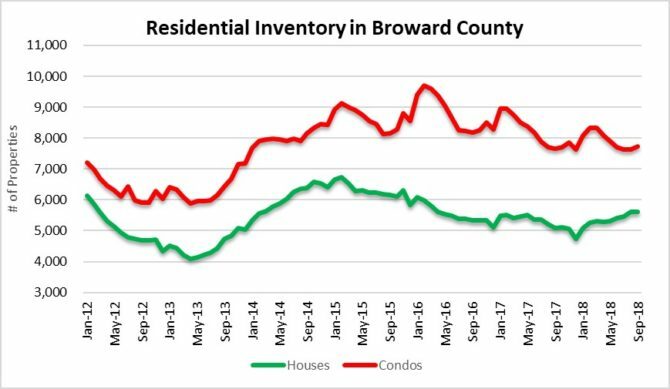 In November there were 14,356 houses and condos on the market throughout Broward County, Florida. You have to go back to February 2017 to see that much inventory and the uptrend sure looks like it will continue. Will they see it? The numbers show that condo prices hit a wall a few months back. The average sale price of a condo was $220,268 in November, representing a 17% decline from the high of $264,975 set in June. As for single-family homes in Broward, the average sale price was $444,247 in November and that was only a 4% drop from June. Will they see it? The party may be over! Although rates have dropped again, it sure looks like the last decade of easy money dragged all of the demand forward. There may be some activity on the lower end of the market, but it sure looks like the luxury market is already getting hit pretty hard. If you are in the market for a property, make sure you do your homework. Make sure that you evaluate the pros and cons of entering the real estate market at this point in the cycle. 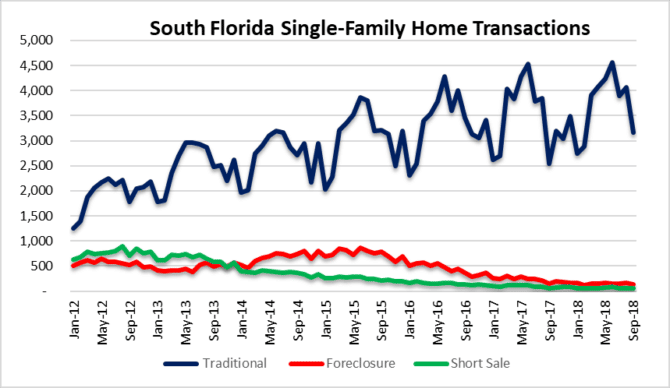 South Florida real estate agents have anticipated an influx of buyers from high tax states impacted by the elimination of SALT deductions, but who knows how long that will last. It’s trick or treat time in the South Florida real estate market. Not just because we are at the end of October, but we may finally see changes in the market,. Higher mortgage rates may finally be doing some damage and could impact selling prices going forward. 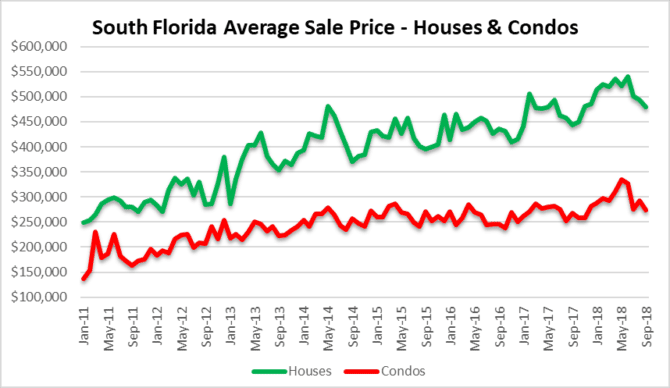 Our first chart shows the average selling price in the Greater Fort Lauderdale / Broward County area. 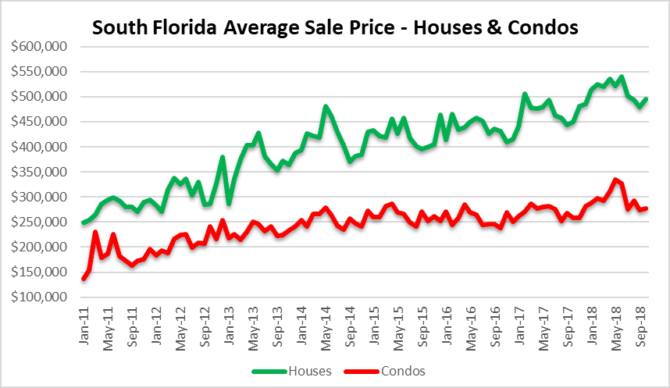 We have been using the month of June as the recent peak in residential prices here in South Florida. Since then, the average sale price of a house declined 8% and condo prices have declined 17%. How about transaction volume? It looks like we got a trick in that area. Deal volume dropped 32% from the June highs. In September there were 2,341 residential closings, down from 3,454 in June. Take a look at the chart. You will see that we have seen transaction volume drop during this time of year historically. One month does not make a trend, so it is worth monitoring as we close out the year. Residential inventory in the Greater Fort Lauderdale market was at 13,324 in the month of September. There has only been a slight increase over the last few months. There were 5,603 houses and 7,721 condos listed for sale during the month of September. If deal volume remains low, inventory will gradually build. Nothing to worry about right now. Have you noticed anything different in your neighborhood? Does it appear as if those for sale signs tend to linger awhile longer than they used to? How about that slick real estate investor trying to flip the house down the street for a quick profit? Do you think they have seen a shift in the market? How about your trusted real estate agent that claims to understand trends and prices? Have you asked them if anything seems different? Well, something has changed in the market and if you don’t know, now you know! Have you noticed prices dropping yet? Residential real estate prices in South Florida are slipping. The average sale price of a house in the tri-county area is down 11% since June. 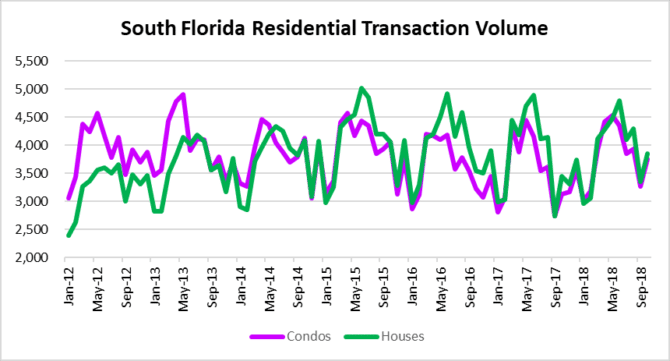 Condo prices have declined 16% for the same period, Although September is typically a slower month, this may be the beginning of a prolonged decline. Have you noticed a jump in mortgage rates? The latest jump in rates may have caught everyone off guard. Not us, we have been warning about this for awhile. The crisis-level interest rates have successfully lured everyone into the real estate market. Now the bills are coming due! We haven’t seen mortgage rates over 5.00% in years and they will place downward pressure on real estate prices. Affordability was a problem in South Florida before the rise in rates. Have you noticed fewer sales? Condo sales haven’t performed any better. They dropped 25% from June. We have discussed at length how record low interest rates spurred a great deal of activity in the real estate markets. It has been quite a party since the last crisis. Now it’s time to deal with the hangover. 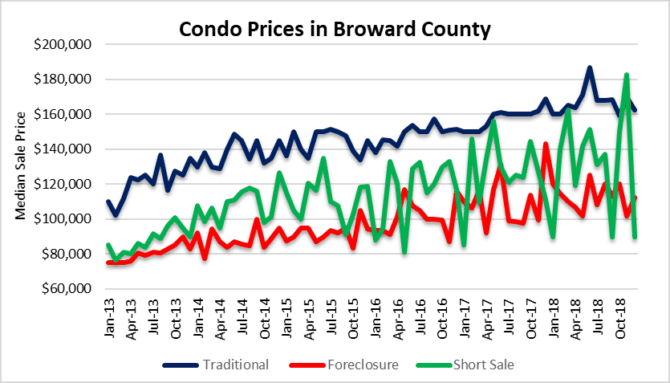 Teaser rates may be a thing of the past and now we will see if the South Florida residential market can hold-up. 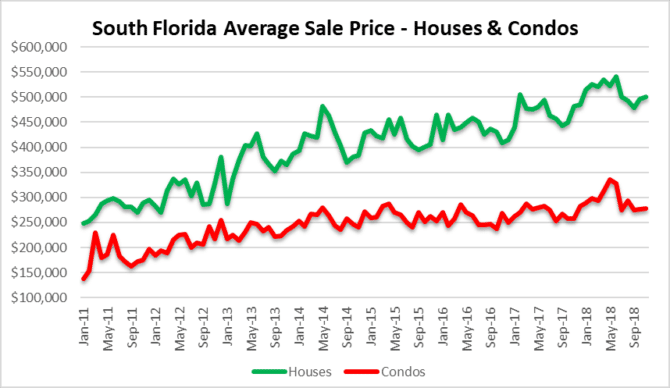 Today we will look at the average sale prices of houses and condos in the Greater Fort Lauderdale area. 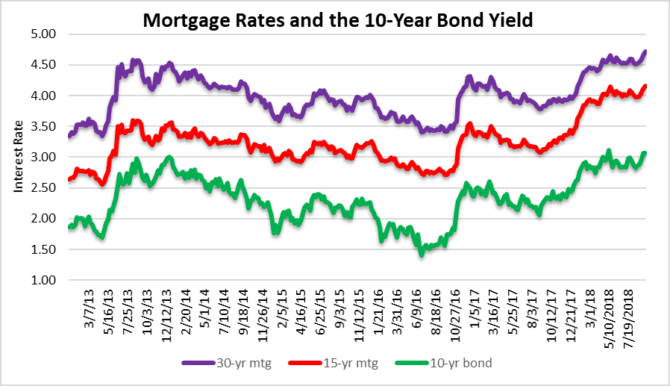 This chart is through August, before the last pop in mortgage rates hit. 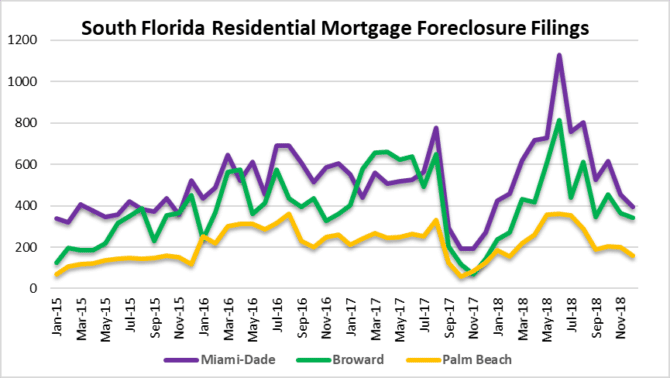 It looks like June was the final month of price gains in the South Florida residential real estate market after years of crisis level interest rates. 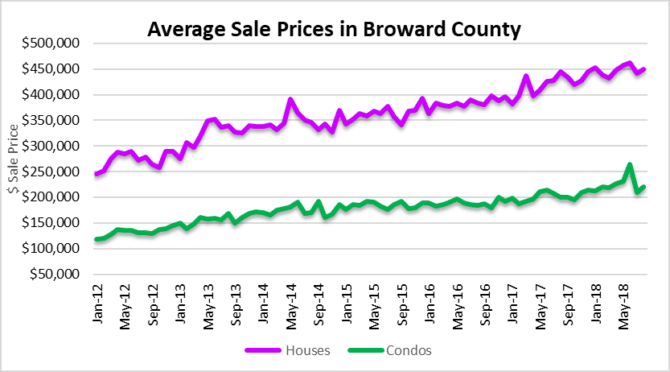 In August, the average sale price of a house in Broward County, Florida was $449,870. This is a 3% decline from June prices. Condo prices averaged $220,116 in August which was a 17% decline from June prices. 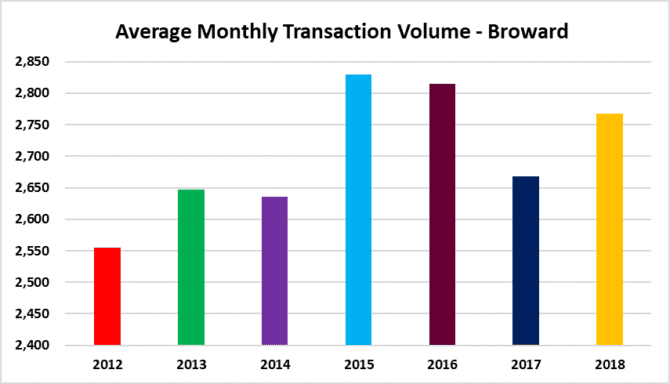 Transaction volume declined from August until June as well. House sales dropped 7% from 1,648 in June to 1,531 closed sales in August. Condo sale declined 18% from !,806 in June to 1,480 in August. 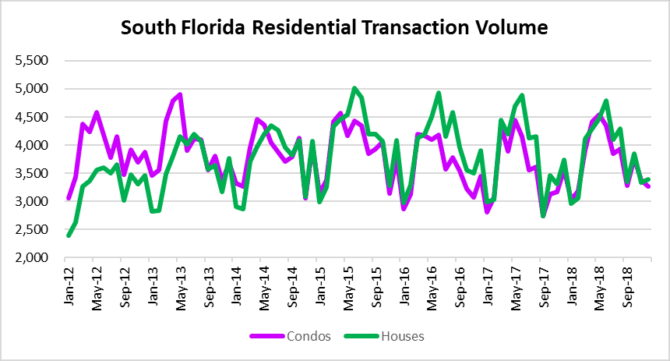 These transaction volume declines occurred before the climb in mortgage rates, so it will be very interesting to see how much deal volume drops over the next few months. Over the last week there was a noticeable increase in mortgage rates that will hit property markets pretty hard. 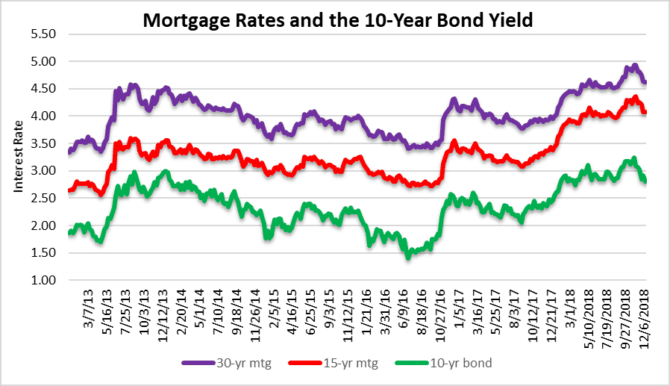 Our chart only dates back to 2013 and rates haven’t been this high since 2011. The Freddie Mac rates are showing 4.9% on a 30-year fixed and 4.29% on a 15-year fixed rate mortgage. These rate quotes do not including points and fees. We are now breaking into a multi-year high on borrowing costs. 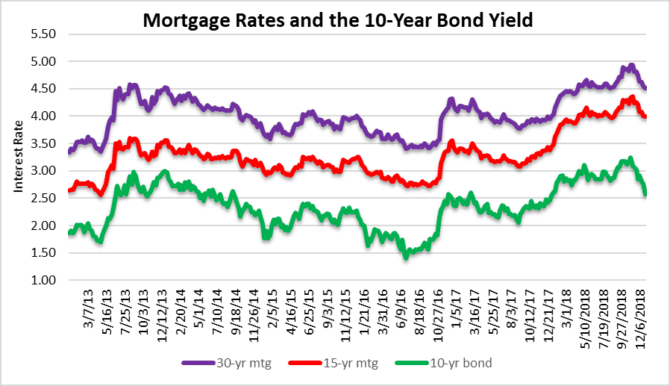 Mortgage rates over 5% will certainly impact real estate prices as we move through the end of 2018 and into 2019. The dangers of keeping interest rates so low for so long is that low rates “tease” people into buying more than they can afford. The low rate environment over the last decade is not much different from teaser rates on credit cards. The stores / banks get you to load-up on debt, the teaser rates expire, rates climb and eventually those bills come due. Be careful out there, the real estate market is changing quickly and something tells me the smart money understands.